Want to be notified of new releases in mantzaris/eurovision? Which countries exhibit collusion or biases when voting in the Eurovision song contest? the dataTables folder provides in CSV format the judges scores for each country during the competitions from 1957 till 2017 with row and column headers to understand easily 'for a country in a particular year, how did that country award the scores it had available'? How many times did country X give country Y substantial votes in 1975-2010 over periods of 5 years? 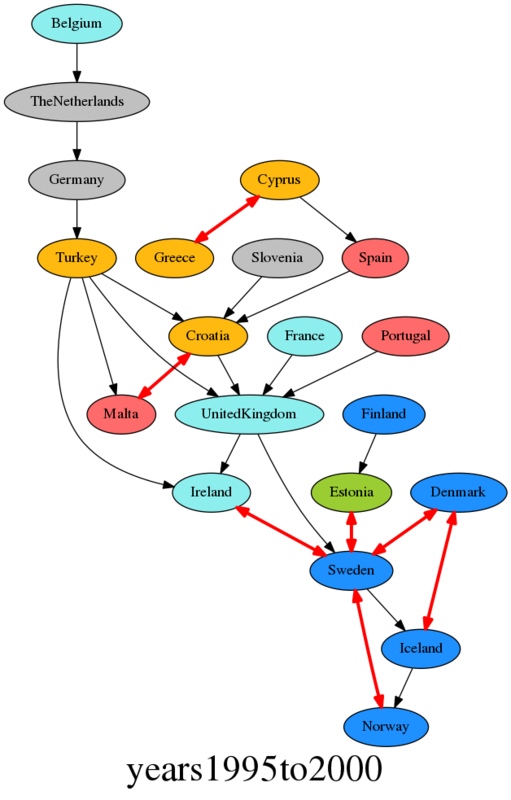 Can we see in a graph the set of edges between all countries that exhibited 1 way or 2 way bias? If we look at a period of X years, is the collusion present in both halfs of this period if we brea the years into 2 different segments? Running the code for the hypothetical scenario, of looking at the period 1990-2010 where the significance is determined in every 5 years. We see in these two periods of 5 years how many times (max 2) collusion between countries existed. We look for the one way biased score allocations between countries in black arrows and the two way collusive edges in red.